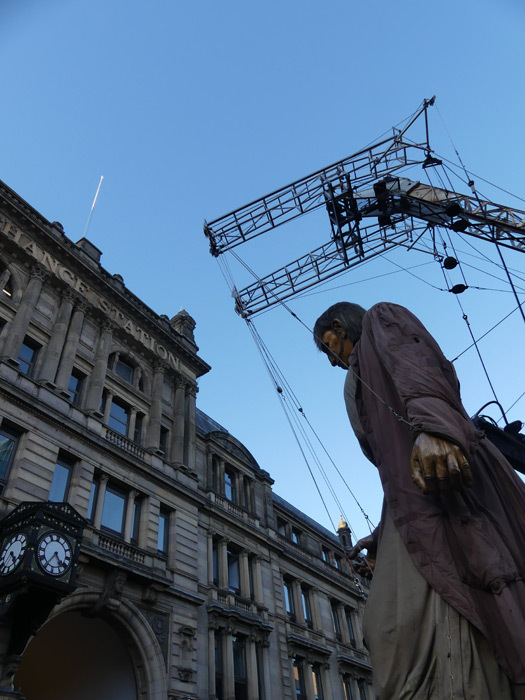 Liverpool is no stranger to big events, but there is none bigger than the weekend of the Giants! 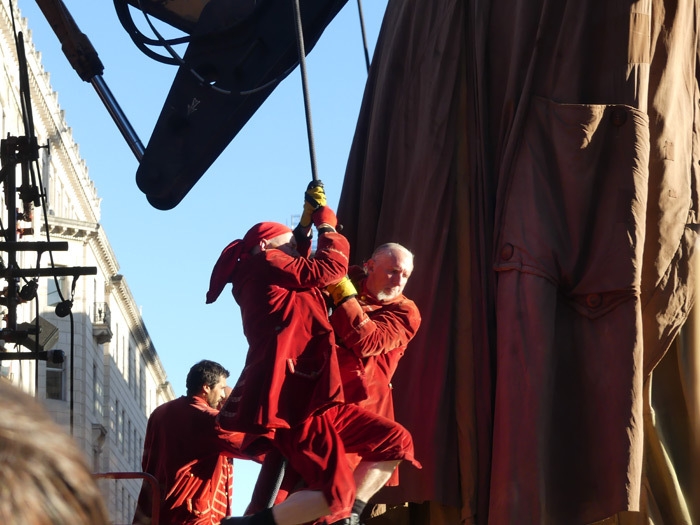 The huge marionettes roamed the city for three days, delighting old and young alike. But while the pure entertainment value of the street theatre is undeniable, the benefits are more far reaching than that. When budgets are being so pared down in schools that there is little or no arts provision, the accessibility of the free event might have been the first experience of theatre for many children. Jamie Johnson is an actor and drama teacher working in Liverpool. He said: ‘Street theatre helps kids, no matter their background, age or life difficulties. They immerse themselves in the characters which helps their social skills and ability to think, as they talk about them. The boost to the local economy was huge, with more than 1.3 million visitors said to have been in the city over the three days, despite erratic public transport timetables. Marj Shaw, 75 from Old Swan queued for 2 hours at Moorfields station on Saturday night to get home, but that didn’t stop her seeing the Giants on the last day. 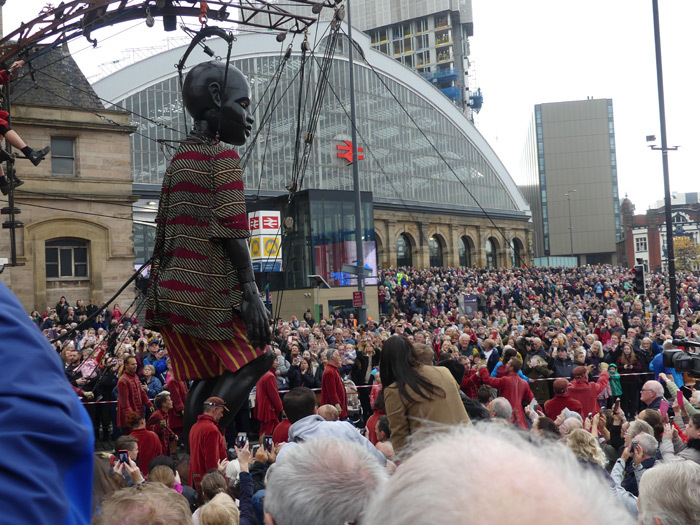 The Royal de Luxe Company were a highlight of the city’s Capital of Culture celebrations in 2008 when Liverpool took them to their hearts, and they returned in 2012. 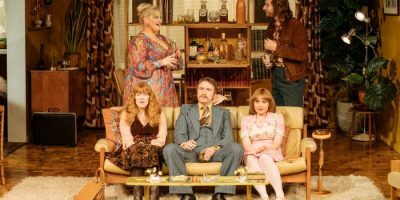 But Artistic Director Jean Luc Courcoult has chosen the 10th anniversary of their first visit to Liverpool for their last ever public performance. Clues, such as a whale – sized sandal being pulled out of Canning dock and a huge fork through the roof of a car, alongside the Bombed Out church, alerted locals to their arrival. The Giant and the little boy then spent three days exploring every corner of the city, but it was Xolo the mischievous dog that really stole the show. 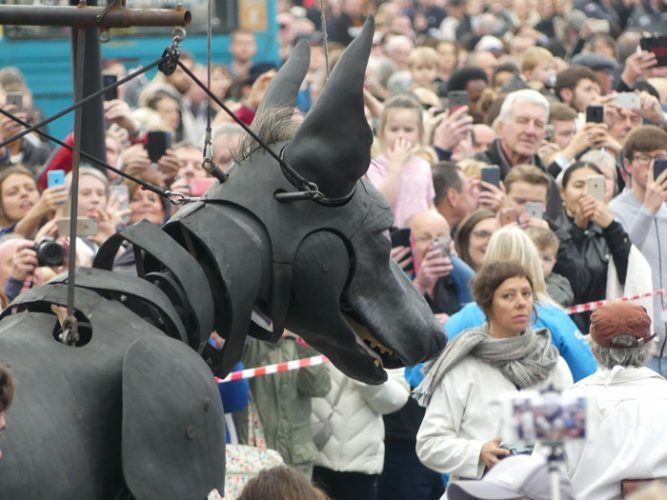 The 12ft canine’s lifelike appeal delighted crowds as he gamboled down the road, teasing onlookers and bumping noses with pet pooches. The Lilliputians – a team of humans! – operate the puppets, treating audiences to their aerial ballet as they swing on the pulleys, all part of the spectacle. In such divisive times the Giants managed to achieve what politicians can only dream of, galvanizing people of all social groups and nationalities. There’s a growing campaign to offer Xolo the dog a permanent retirement home at one of the Liverpool museums, so special is he to the people of this city. Jean Luc has said that he wants to work on brand new projects, and no doubt he will continue to dazzle. But big footprints have been left to fill! Technically amazing but couldn’t the money spent here have gone into schools involving kids directly in designing and making, say puppets, building their skills and confidence, with a parade as an outcome, rather than another spectacle with no lasting benefit. Businesses, most based outside Liverpool, were the biggest winners here. Nice, but a bit of a waste of money!